Heaven and Hell on Earth: The Massacre of the"Black Donnellys"
Like an actual archive, this section holds all of the documents found elsewhere on this site. These are exact copies of the documents found in the subsections of the main areas of the website -- “Context”, “Prelude”, “Massacre” and “Aftermath”. Here the items are organized by document type much as they would be organized in traditional archives, rather than by theme. Why duplicate the items? This organization may aid you in your research once you have read through the rest of the website. In addition, citations at the bottom of each item will provide you with information about the original archives/collection in which the document was located. At the top of each document the “About this Source” button will link you to more specific details about why and how historians would use that particular type of source. Typically an archive is a location/building where historic documents, images, maps, recordings and film are collected, organized and preserved. 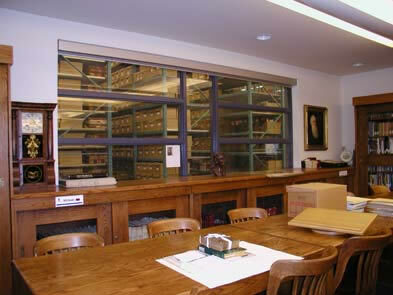 Different archives have mandates to collect a range of material which might include government, corporate, or personal records, and they vary in size from a few boxes of material in a basement to a giant climate-controlled warehouse. Without these primary sources, it would be very difficult to study and write about history. This is a “virtual archives”, focused on the Donnelly mystery. The creators of this site have searched through many, many items from a variety of archives. Unlike an actual archive, the purpose of this website is not to preserve items, but to increase accessibility. We have brought the archives to you. As large and complex as it is, this website holds only a tiny portion of all of the items in existence that relate to the Donnellys. We have had to make difficult choices about what to include to ensure that the website is comprehensible and informative. In many cases we have included only part of a document. For instance, dozens of people testified at the two trials. It would be impractical to expect you to read all of these documents. Instead, we have selected the testimonies that we feel are most significant and informative. For the sake of keeping the site manageable and avoiding repetition, we have made some selections for you while being careful to include the full range of possibilities suggested by the evidence. We hope your research on this website will motivate you to one day go and visit an archives first-hand. The main archives consulted in the making of this website are listed below. In the meantime, you can read through the documents on this website to get a sense of both the history of the Donnellys, and what it is like to be a professional historian.